The core of the Salt State system is the SLS, or SaLt State file. The SLS is a representation of the state in which a system should be in, and is set up to contain this data in a simple format. This is often called configuration management. This is just the beginning of using states, make sure to read up on pillar Pillar next. Before delving into the particulars, it will help to understand that the SLS file is just a data structure under the hood. While understanding that the SLS is just a data structure isn't critical for understanding and making use of Salt States, it should help bolster knowledge of where the real power is. SLS files are therefore, in reality, just dictionaries, lists, strings, and numbers. By using this approach Salt can be much more flexible. As one writes more state files, it becomes clearer exactly what is being written. The result is a system that is easy to understand, yet grows with the needs of the admin or developer. The example SLS files in the below sections can be assigned to hosts using a file called top.sls. This file is described in-depth here. By default Salt represents the SLS data in what is one of the simplest serialization formats available - YAML. These demos use some generic service and package names, different distributions often use different names for packages and services. For instance apache should be replaced with httpd on a Red Hat system. Salt uses the name of the init script, systemd name, upstart name etc. based on what the underlying service management for the platform. To get a list of the available service names on a platform execute the service.get_all salt function. Information on how to make states work with multiple distributions is later in the tutorial. This SLS data will ensure that the package named apache is installed, and that the apache service is running. The components can be explained in a simple way. The first line is the ID for a set of data, and it is called the ID Declaration. This ID sets the name of the thing that needs to be manipulated. The second and third lines contain the state module function to be run, in the format <state_module>.<function>. The pkg.installed state module function ensures that a software package is installed via the system's native package manager. The service.running state module function ensures that a given system daemon is running. Finally, on line five, is the word require. This is called a Requisite Statement, and it makes sure that the Apache service is only started after a successful installation of the apache package. When setting up a service like an Apache web server, many more components may need to be added. The Apache configuration file will most likely be managed, and a user and group may need to be set up. This SLS data greatly extends the first example, and includes a config file, a user, a group and new requisite statement: watch. Adding more states is easy, since the new user and group states are under the Apache ID, the user and group will be the Apache user and group. The require statements will make sure that the user will only be made after the group, and that the group will be made only after the Apache package is installed. Next, the require statement under service was changed to watch, and is now watching 3 states instead of just one. The watch statement does the same thing as require, making sure that the other states run before running the state with a watch, but it adds an extra component. The watch statement will run the state's watcher function for any changes to the watched states. So if the package was updated, the config file changed, or the user uid modified, then the service state's watcher will be run. The service state's watcher just restarts the service, so in this case, a change in the config file will also trigger a restart of the respective service. When setting up Salt States in a scalable manner, more than one SLS will need to be used. The above examples were in a single SLS file, but two or more SLS files can be combined to build out a State Tree. The above example also references a file with a strange source - salt://apache/httpd.conf. That file will need to be available as well. The SLS files are laid out in a directory structure on the Salt master; an SLS is just a file and files to download are just files. So the httpd.conf is just a file in the apache directory, and is referenced directly. The same applies for any subdirectories, this is especially 'tricky' when git repos are created. Another command that typically can't render it's output is `state.show_sls` of a file in a path that contains a dot. Notice that we use two similar ways of denoting that a file is managed by Salt. In the /etc/ssh/sshd_config state section above, we use the file.managed state declaration whereas with the /etc/ssh/banner state section, we use the file state declaration and add a managed attribute to that state declaration. Both ways produce an identical result; the first way -- using file.managed -- is merely a shortcut. This example now introduces the include statement. The include statement includes another SLS file so that components found in it can be required, watched or as will soon be demonstrated - extended. The include statement allows for states to be cross linked. When an SLS has an include statement it is literally extended to include the contents of the included SLS files. Note that some of the SLS files are called init.sls, while others are not. More info on what this means can be found in the States Tutorial. Sometimes SLS data needs to be extended. Perhaps the apache service needs to watch additional resources, or under certain circumstances a different file needs to be placed. In these examples, the first will add a custom banner to ssh and the second will add more watchers to apache to include mod_python. The custom-server.sls file uses the extend statement to overwrite where the banner is being downloaded from, and therefore changing what file is being used to configure the banner. In the new mod_python SLS the mod_python package is added, but more importantly the apache service was extended to also watch the mod_python package. The extend statement works differently for require or watch. It appends to, rather than replacing the requisite component. Since SLS data is simply that (data), it does not need to be represented with YAML. 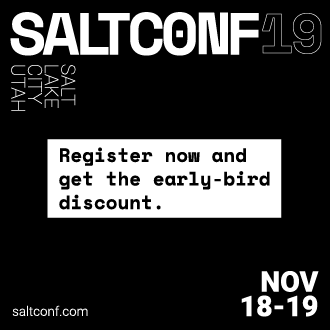 Salt defaults to YAML because it is very straightforward and easy to learn and use. But the SLS files can be rendered from almost any imaginable medium, so long as a renderer module is provided. The default rendering system is the jinja|yaml renderer. The jinja|yaml renderer will first pass the template through the Jinja2 templating system, and then through the YAML parser. The benefit here is that full programming constructs are available when creating SLS files. Other renderers available are yaml_mako and yaml_wempy which each use the Mako or Wempy templating system respectively rather than the jinja templating system, and more notably, the pure Python or py, pydsl & pyobjects renderers. The py renderer allows for SLS files to be written in pure Python, allowing for the utmost level of flexibility and power when preparing SLS data; while the pydsl renderer provides a flexible, domain-specific language for authoring SLS data in Python; and the pyobjects renderer gives you a "Pythonic" interface to building state data. The templating engines described above aren't just available in SLS files. They can also be used in file.managed states, making file management much more dynamic and flexible. Some examples for using templates in managed files can be found in the documentation for the file state, as well as the MooseFS example below. This example is simple. If the os grain states that the operating system is Red Hat, then the name of the Apache package and service needs to be httpd. This example shows much more of the available power of Jinja. Multiple for loops are used to dynamically detect available hard drives and set them up to be mounted, and the salt object is used multiple times to call shell commands to gather data. Sometimes the chosen default renderer might not have enough logical power to accomplish the needed task. When this happens, the Python renderer can be used. Normally a YAML renderer should be used for the majority of SLS files, but an SLS file set to use another renderer can be easily added to the tree. This is a very simple example; the first line has an SLS shebang that tells Salt to not use the default renderer, but to use the py renderer. Then the run function is defined, the return value from the run function must be a Salt friendly data structure, or better known as a Salt HighState data structure. This example clearly illustrates that; one, using the YAML renderer by default is a wise decision and two, unbridled power can be obtained where needed by using a pure Python SLS. This should help troubleshoot the issue. The minion can also be started in the foreground in debug mode by running salt-minion -l debug.